Know how sometimes you spend a long time looking at something before you can put a name to it? Before you remember what it’s called? It was like that. Oblong, grey head, mess-a-legs. And I sat in the tub for a solid three minutes before the word hit me. Squid. 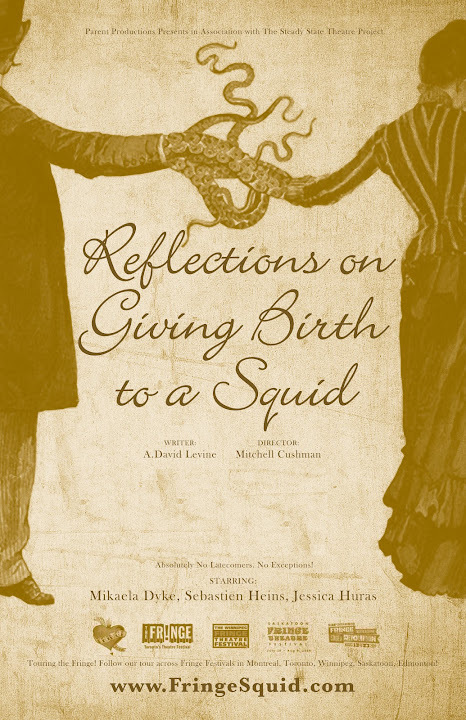 Unique in both form and content, Reflections on Giving Birth to a Squid tells the oldest of stories – a story of love and faith, of mother and child – in the strangest of contexts: What would you do if you gave birth to a squid? Squid is the tale of a nameless woman who has given birth to the inexplicable. When her husband, her neighbours and her world demand answers she doesn’t have, she is forced to confront motherhood, faith, language, love, and what makes a family. Told through a series of short scenes and making creative and editorial use of projection in both set design and staging, Squid has been a surprise to most audiences – what begins as a tale of the tawdry evolves into a thoughtful, touching look at a woman betrayed by the unknown, and a reminder of the infinitesimal things that bind us all together.